Whether you're looking for a solution to messy salad dressing containers or inefficient liquor pourers, this 1 qt. pour bottle with red spout and cap will meet your needs! The white 1 qt. container is made of high density polyethylene with straight walls that won't harbor bacteria, and a ridge that accepts the cap while not in use so it doesn't get lost. The neck gives your employees a secure grip as they pour drinks for customers and is detachable so it's easy to clean at the end of the night. The included red spout keeps bugs out and promotes fast, controlled pouring. When it's time to store product, simply remove the cap from the bottom of the container, screw it on in place of the detachable neck, and place it in the refrigerator! These work much better than plain white bottles. It is easy to see the difference between all the juices behind the bar. Easy to clean and put back together. Love, these pour bottles and their color coded bottoms help manage different juice and drinks, we use these red ones for cranberry juice and some house shots. This pour bottle is great. I would recommend to anyone. My bartender finds them extremely easy to use and cleaning them is easy as well. Love the fact that we can get different colors for different products without having the spend the additional money on store and pour brand. Love these containers. The 1 Qt. Pour Bottle and Red Spout and Cap is great for color coding. It is durable and the spout and cap fit and seal well. It is also easy to clean. The price is fantastic! This is great for storing homemade sauces and dressings. We own a variety of colors of pour bottles because it makes finding certain drinks much faster then reading labels. Color coding your drinks will help increase your bartenders efficiency and lessen the customer wait time. All parts are removable on this bottle to allow for easy cleaning. 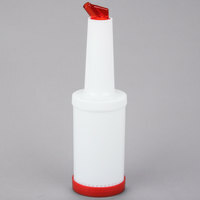 We use this red bottle to hold our orange extract to make it much easier to pour in to our red velvet batter as needed. Then it is less likely to spill because of the cap we put on when we are done. A must have for professional bar tending!! These are easy to clean and come with colored pour spouts and lids to identify what juice you are using and storing!! What's to say, these are basically the same as the name brand ones but less than half the price. Different colors are great but honestly our servers never use the colors to sort mixers, etc. Oh well, still good stuff! These were very useful at my outdoor bar area. I had every flavor to put in every color jar i purchased from Webstaraunt. Thank you. You cannot beat the price for these bottles, and they include the cap! We have been very happy with the quality of these for our bar, and even ordered more. Awesome 1 qt pour bottle for our restaurant. Color spout helps us determine what is in it quickly. Easy to take apart and clean and was offered at a great price. We use these pourers all the time it makes pouring highly use mix drinks very easy. They are easy to clean up and by having the various colored tops is great for identification. Great bottles for bar backs. Easy to identify as well with the colored spouts and bottoms - only thing that could make these better is if the spout had a cap. Had No issues with Red cap pour, very please with what it offers me and how it has help serving fast at the bar. Will be sure to order more in due time. We use these bottles a ton and they are so much cheaper than the name brand ones. Well make and they last a long time. Will continue to purchase!!! I give 5 stars to these item * * * * * its perfect for my stores I use for the pinaple juice, water and coco lopez good! I couldn't be more pleased! This was exactly what I needed to have juice ready for the quick pour. Mixing many drinks and having to stop and open a bottom of orange juice to make a screwdriver takes time and with these and their color tops it makes it much quicker. They have a great seal and clean very easy. I would highly recommend them.